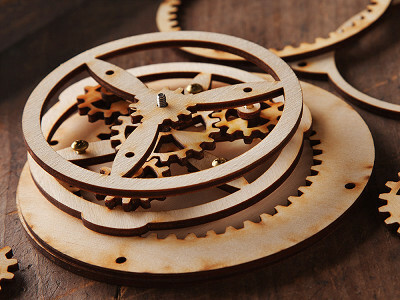 SteamyTech brings the wide world of Steampunk to The Grommet. Inspired by the fantastical technologies in the works of H.G. Wells and Jules Verne, this Sci Fi sub-genre is set against the smokestacks of the Industrial Revolution. In this world, anything is possible using steam engines, clockwork gears, and just the faintest hint of magic. 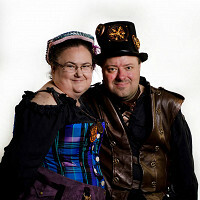 Greg and Lora Price, SteamyTech founders, first discovered Steampunk at a 2012 convention. They witnessed Steampunk’s role as major inspiration to the Maker Movement, spurring the creation of beautiful handmade items. But they wondered why most of the crafts had immovable gears. The husband-wife team’s decorative designs are made in the USA with laser-cut pieces that incorporate functional gears that you can move. Their signature work is the “Aether Catcher,” a wondrous Steampunk device that simulates capturing the very essence of reality. Eight color-changing LED’s shine brightly through Steampunk inspired gears and designs, casting a luminous display in a dark room. 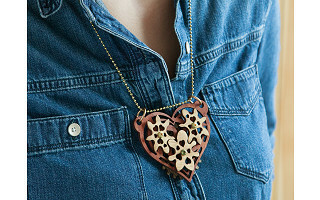 SteamyTech integrates whimsical designs and a hint of wonder into every finished piece and DIY kit they create. From start to finish, SteamyTech kits are imaginative, fun manifestations of the fantastical world of Steampunk. Hi everyone. I'm Lora, co-founder of SteamyTech. We're excited to share our line of products with you today. We've been traveling to conventions and Maker Faire this summer along with spending some time in the lab designing new and exciting projects. We look forward to answering your questions today. We're excited to hear what you think. Hi Bienvenido, Kristan here from The Grommet. Thanks for your great question. Greg and Lora do create artwork that can be battery operated, but The Grommet is not carrying those items at this time. We hope you will enjoy whichever type of Steampunk Gear Art you choose to have in your home. @teresa Our kits are great for kids. The heart kit is the simplest kit, followed by the coaster, and then the 2 layer toy. The kits can be colored using sharpie markers, so coloring shouldn't be a problem for a 6 or 7 year old. I would recommend either the heart or coaster kit for someone that young.